This Executive CEO and President resume sample was developed for a C-Level CEO/President job applicant. As you can tell, this executive has a great deal of experience – over 20 years in fact! Scroll down to review the two-page Executive CEO and President resume example. I wanted to showcase her outstanding expertise, talents, skills, and relevant education. I chose an easy-to-read format that would bring focus to her exceptional leadership qualifications. As you will note, the client’s track record for revenue growth is clearly displayed, along with her ability to slash expenditures. When writing a resume it is vital to show your senior leadership qualities to generate an interview. This Executive CEO and President resume sample will entice the reader to go through the entire document, instead of a simple scan. It is evident this job applicant is a well-rounded and strategic decision-maker who can guarantee exponential growth of any company, particularly within the finance industry. 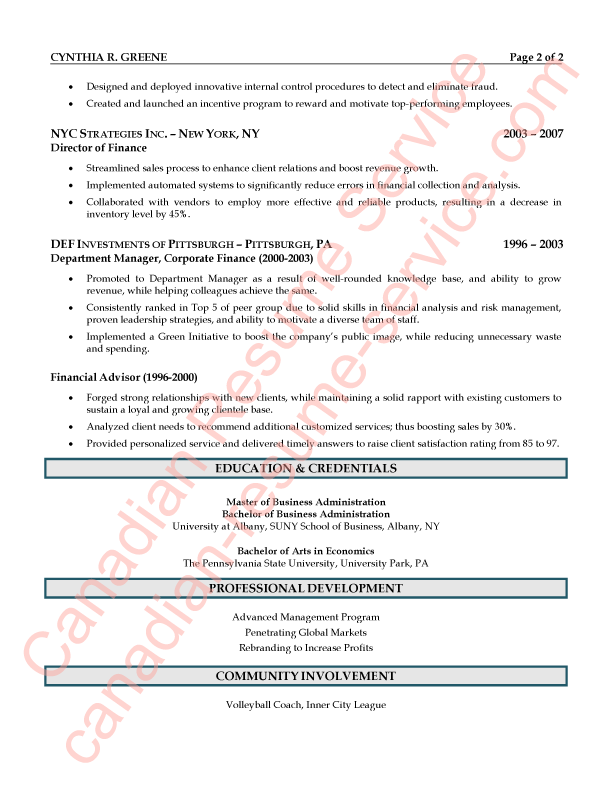 A clean and attractive executive resume format was chosen to control and direct the reader’s attention, highlighting the most impressive points first. For instance, the bullets themselves within the Introduction point to the person’s greatest strengths. After the introduction, you will note an Areas of Expertise that demonstrate core competencies in an easy-to-read fashion, which also reinforce the strengths listed above on the resume. Next, the job applicant’s Professional Experience is showcased, including her prior job responsibilities and standout achievements. These achievements will show any company why they would be lucky to have her as their leader. The next section is Education and Credentials, which highlights her Master of Business Administration Degree, as well as Bachelor’s Degrees. Professional Development and Community Involvement are the final two segments of the executive resume. The client’s additional courses and development initiatives are demonstrated, along with her volunteer work as a volleyball coach. It is important to be well-rounded, possess a growth mindset, and be willing to give back to the local community. This will definitely put her ahead of any other job competition! Not only does this executive resume read well, it is also visually appealing and grabs the reader’s attention. The client’s name is large and in charge. It’s clear who is applying for this CEO President position – and applying with enthusiasm and focus! The job applicant’s professional position is highlighted with a blue border and gray shading, which make it really stand out. The section headers, such as Professional Experience and Education and Credentials, are highlighted in the same fashion. This maintains consistency throughout the document, grabs the reader’s focus, makes you memorable, and sets you apart from the competition. As mentioned above, bullet points have been incorporated in this executive resume example. They help break down and display pertinent information in a list format. There is plenty of information contained in this document; however, there is an appropriate amount of white space in the resume, so the reader does not become overwhelmed or get lost amongst the sections. An array of executive level accomplishments are included to communicate that Cynthia has achieved or exceeded numerous company benchmarks. This indicates she can do the same thing for her next employer. When you are writing your resume for an executive position or any job the number one resume writing tip is to dig for professional accomplishments. 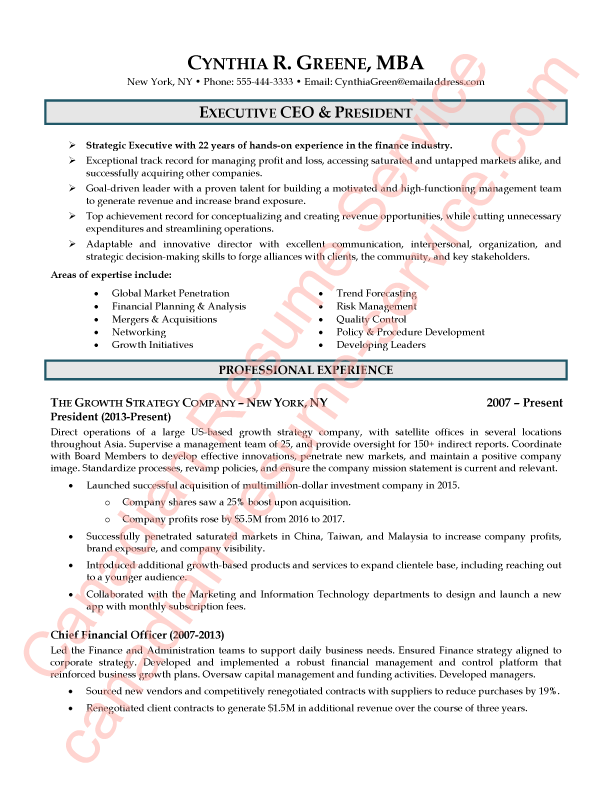 I hope you found this Executive CEO and President resume sample helpful. Need help writing your executive resume? Review our executive level resume writing services.